A few years ago, when I was overweight, diagnosed with cancer, chronic fatigue, adrenal failure, digestive collapse, chemical sensitivities, food allergies, and two frozen shoulders, I began to make changes in my diet and lifestyle, slowly – just one change a week. If I felt better, I would hold onto the change to make it a habit. I noticed my self-defeating thoughts and fears that drained my energy – like a bucket filled with holes. I used my experience as a chef and healer. I started moving, doing yoga, qigong, martial arts, and dancing! The habit of changing one thing a week became a kind of a game. I resolved all those issues and my health is still improving. My goal with this website is to share my discoveries, to empower you to live the life you truly desire and deserve. I invite you to take control of your health and live up to your dreams. My biggest “Aha!” discovery was how to lose weight easily without deprivation. We know weight gain is associated with insulin production and carbohydrates. It’s so simple. When we reduce the sugars and carbs, especially refined carbs, the weight just falls off. So weight gain isn’t so much about calories or fat, as it is about sugars and carbs. 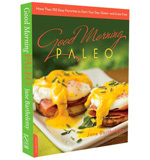 I wrote this website and my books Paleo Desserts and Good Morning Paleo, to share the secret about how to lose weight without effort. We can still enjoy our favorite foods using low carb flours like coconut and almond flour, zero sugar natural sweeteners, protein, healthy fats, and 100% unprocessed ingredients. All the recipes in my blog and books conform to this low-carb, easy weight loss system. Transform your food transform your life!